The Northrop F-5A/B Freedom Fighter and the F-5E/F Tiger II are part of a family of widely-used light supersonic fighter aircraft, designed and built by Northrop. Hundreds remain in service in air forces around the world in the early 21st century, and the type has also been the basis for a number of other aircraft. The F-5 started life as a privately-funded light fighter program by Northrop in the 1950s. The first-generation F-5A Freedom Fighter entered service in the 1960s. During the Cold War, over 800 were produced through 1972 for U.S. allies. The USAF had no need for a light fighter but specifed a requirement for a supersonic trainer, procuring about 1,200 of a derivative airframe for this purpose, the Northrop T-38 Talon. The improved second-generation F-5E Tiger II was also primarily used by American Cold War allies and, in limited quantities, served in U.S. military aviation as a training and aggressor aircraft; Tiger II production amounted to 1,400 of all versions, with production ending in 1987. Many F-5s continuing in service into the 1990s and 2000s have undergone a wide variety of upgrade programs to keep pace with the changing combat environment. The F-5 was also developed into a dedicated reconnaissance version, the RF-5 Tigereye. The F-5 also served as a starting point for a series of design studies which resulted in the twin-tailed Northrop YF-17 and the F/A-18 series of carrier-based fighters. The Northrop F-20 Tigershark was an advanced version of the F-5E that did not find a market, thanks to the meddling of politicians who removed advanced systems from the aircraft before allowing foreign sales. The F-5N/F variants remain in service with the United States Navy and United States Marine Corps as an adversary trainer. 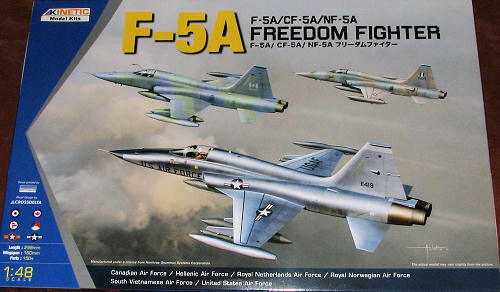 The model community has long awaited a new tool 1/48 F-5A/B kit. True, there was a short run version produced by Classic Airframes and your editor built a couple of these, however, it was typical of the genre and required advanced modeling skills to complete. No longer as we now have a standard injection molded kit from the folks at Kinetic. The kit is designed in modular fashion, boding well for a variety of F-5 types to be done in the future. Basically, the fuselage is built in forward and aft sections with various inserts to take care of the difference in the F-5As built for some places like Canada and the Netherlands. The kit comes with complete intakes, a nice touch, though perhaps somewhat difficult to built and eliminate the seam that runs down the length on both sides. There are separate control surfaces for the rudder, ailerons and flaps. The latter can be molded in the lowered position. A separate insert for the engine cooling doors used on Dutch and Canadian aircraft are included as are the additional upper rear fuselage cooling vents. Moving forward, there are separate speed brakes and another insert for the forward fuselage side and for the lower forward fuselage. The cockpit is well appointed with raised detail for the instrument panel and consoles. 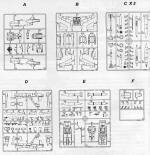 There are two different nose gear arrangements, again depending on if a standard F-5A or CF/NF-5A are being built. The canopy can be posed in the open position. For the wings you can put Sidewinders or tip tanks on the end. I am not sure if the tanks are properly angled down or not as it is difficult to tell without building the kit. Under the wings are four pylons for Mk.82 slick bombs, rocket pods or drop tanks. Two different centerline tanks are also provided. Another inclusion is a small photo etch fret for the slime lights (when required) and vents. 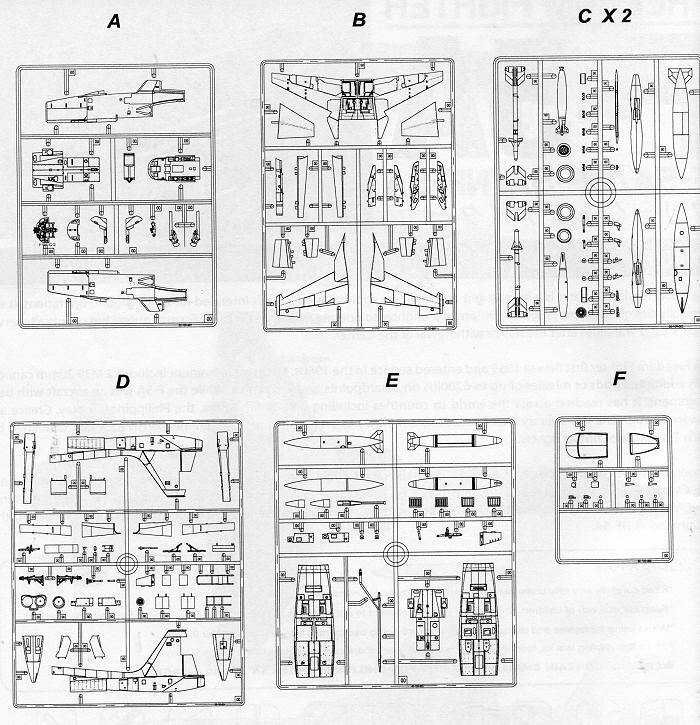 The instructions are a whopping 34 pages, though much of that is for the 16 markings options and for the different construction sequences for the standard and CF/NF-5 versions. There are three US options; two in silver portraying a prototype and one with the 4441 CCTS. A third one is listed as being ADC Grey with daglo patches flown at Kelly AFB while awaiting delivery to Greece. For Canada there are three options. One is in the final 'glop' scheme in 1995 that is stored with the Canadian Warplane Heritage. Then there is a 434 Squadron aggressor that is displayed at the Canadian Aviation and Space Museum, also in 'glop'. The last one is a 434 Squadron plane in the green/grey wrap scheme of 1988. Moving on to the Netherlands we have two options, both with 315 Squadron One in the original NATO scheme and one with the latter greys. Then we have a pair of Norwegian aircraft in silver. One with 336 Squadrons as the Jokers aerobatic team and another with 334 squadron. Both of these options have multiple serial/code choices. Then we have Greek planes with five options. The first three are with 341 squadron; two in dark blue-grey over silver and one in the latest 'glop' scheme. The Greek AF markings I have seen in person and on slides are a much darker blue, but that is not to say the light blue was not used. You can see from the photo that there are a BUNCH of different camo schemes that can be used on Greek F-5s. You can also see what I meant by the angled down tip tanks. Next is an NF-5A with 349 Squadron in two shades of light grey with the final scheme being another NF-5A with 343 Squadron, also in a glop scheme. The final option os a South Vietnamese plane with 522 Squadron in 1969. This one also has multiple serial choices. I am sure many will be eager to get their hands on this one if they have not already. I have to honestly say that I was hoping for a more crisply molded kit as detailing seems a tad on the soft side. I also found some flash, something one does not expect from a new kit, but it is nothing major. I also really dislike the flimsy, one-piece, end-opening box. Surely a kit of this size and price deserves a real box. 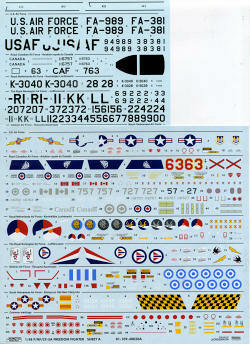 The comprehensive decal sheet is a real bonus and should not leave anyone lacking in markings options. Those wanting something different will be glad to know that both Caracal and Leading Edge provide new or relatively new sheets to give you other options. My thanks to, well, me for picking this one up.